They were all volunteers and it took them seven years to reach their goal: They brought the railway line Carnoules – Brignoles, and soon Carnoules – Brignoles – Saint Maximin, back to life. They welcome you today to share a dream which has become reality. The railway line Carnoules – Gardanne is 49 miles (79 km) long. It was opened to public service in 1880 by the Company of "Paris à Lyon et à la Méditerranée" called PLM. 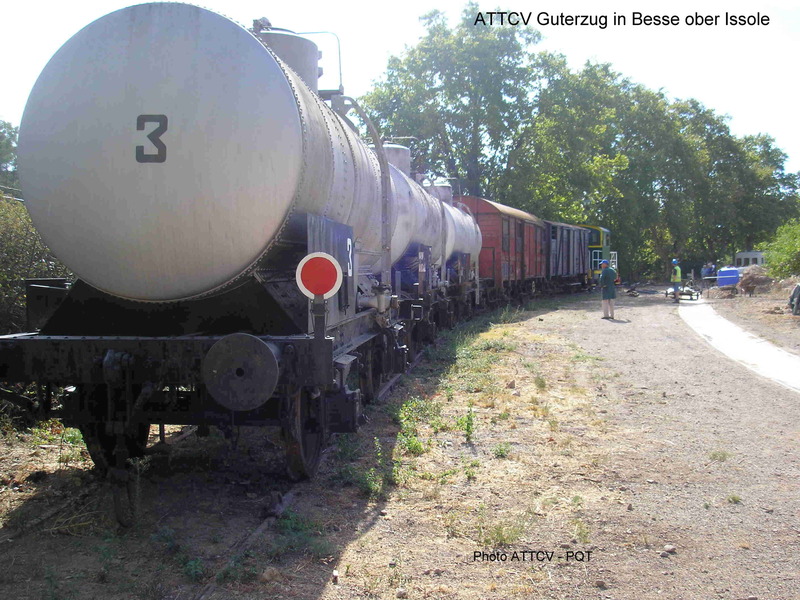 It links scarcely populated areas and was used mainly to carry goods: mostly coal from Gardanne to Carnoules et bauxite from Besse and Brignoles to Gardanne. The hardly used passenger trains stopped their service in 1939. The heavy ore transport came to end too, as the mines were shut down in 1980. So the whole regular railway traffic disappeared in the 80s on this particular Var line. The railcar "Picasso" was built in 1965 by ANF (Ateliers du Nord de la France) on a SNCF design. It offers to you a comfortable speed of 25mph (40 km/h). It starts from Carnoules at the station "Carnoules Les Platanes" near the crossing with road D13. You will pass through the villages of Besse, Sainte Anastasie, Forcalqueiret, Camps La Source, and La Celle. 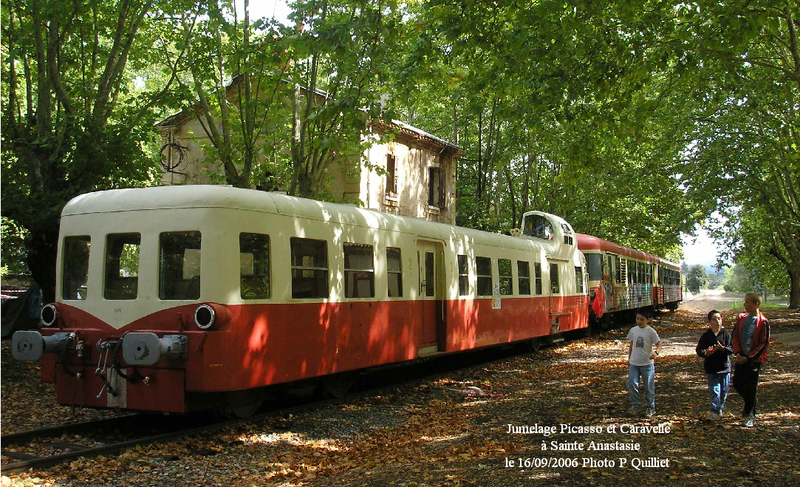 The train stops for a few minutes at the station of Sainte Anastasie, where you can discover an old little station newly renovated and buy inside some handcraft products manufactured along the line. The typical Provence countryside is here to be enjoyed. It consists of stony hills and plains where vineyards and olive trees grow. And in this landscape, dark cypresses are to be seen everywhere. The railway line is running at an average height of 660ft to 990ft (200 to 300 meters). Our speed allows you to see the feudal castle of Forcalqueiret, the Issoles River and the pink marble Rock of Candelon. Today, the trip ends at Brignoles where you can visit the museum of the "pays brignolais", and soon you will be able to get to Saint Maximim and visit its Basilica. 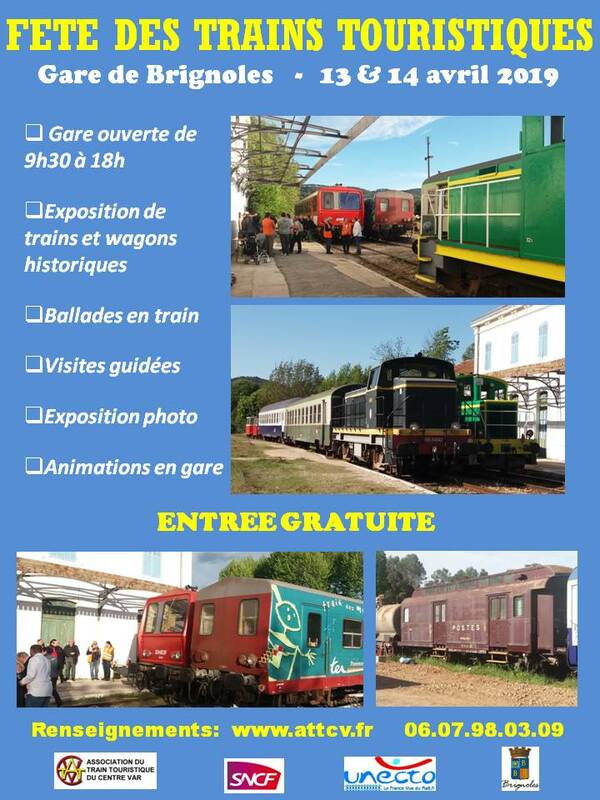 We wish you an excellent journey in the touristic train of Centre Var. Association du Train Touristique du Centre Var. Siège social : Mairie de Carnoules, 2 cours Victor Hugo 83660 Carnoules. Tél : 33 + 6 07 98 03 09.